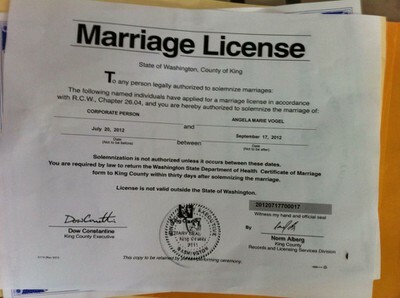 A group of Seattle area activists just received a marriage license approving the marriage of Angela Vogel and a corporation called “Corporate Person”. Jeff Reifman, the registered agent of Corporate Person spoke to me via phone moments after receiving the wedding certificate. Til death do her part. Reifman, who is collecting signatures to put a Seattle-area initiative 103 up for a public vote, created a corporation called Corporate Person in order to illustrate the inanity of treating corporations like people. Initiative 103 would eliminate corporate personhood in the City of Seattle only. “If they were to reject the license, they would be facing a lawsuit from Corporate Person, and the city shouldn’t waste money defending yet another lawsuit,” said Reifman. The City of Seattle is currently being sued by phone book companies claiming opt-out legislation restricts their access to free speech. The marriage has especially relevant historical significance. In 1971 John Singer and Paul Barwick, two gay activists, marched up to city hall and asked for a marriage license. Lloyd Hara, then acting as the county auditor, refused. This kicked off Singer vs. Hara, one of the first gay marriage lawsuits in the nation. 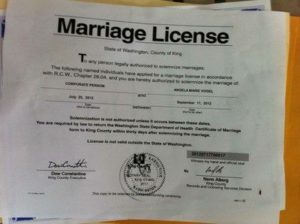 The Washington State Court of Appeals denied the men’s right to marry in 1974. Angela Vogel, the bride in today’s wedding, would still be denied a marriage license with another woman today. Corporate Person is apparently male. This blog post was written by Devin Glaser, longtime friend and volunteer of the Bus.